Lateral and Medial Epicondylitis are known as Tennis Elbow or Golfer’s Elbow and are an inflammation of the tendons of the arm. These injuries tend to be quite common and mostly occur because of overuse. 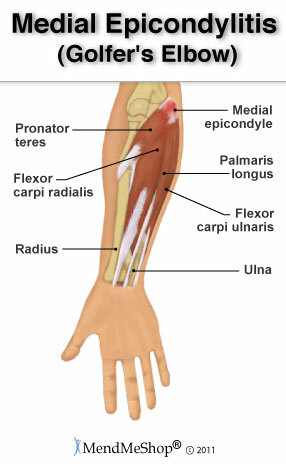 These tendons are bands of tough tissue that connect the muscles of the arm to bone. 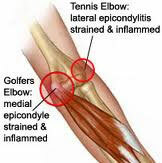 Despite the names of Golfer and Tennis elbow these injuries occur quite often in people who do not play these sports, rather an overuse or repetitive use that may occur because of work or activities that inflame these tendons. Tennis elbow or Lateral Epicondylitis is the most common of the two and although it can happen to anyone, it is more common in people over the age of 40. For tennis elbow or lateral epicondylitis repetitive motion like grabbing a racquet , during a swing can strain muscles and put stress onto tendons they attach to. These constant movements cause microscopic tears in the tissue. The symptoms may appear gradually or suddenly with pain. Activities usually aggravate the condition. No. Both our locations are private, however most of our services are often covered by an extended health care plan (some of which we can directly bill). We also offer fee-for-service for those without benefit plans.